Mitsubishi Chemical Advanced Materials materials are commonly used in processing equipment and products requiring various types of regulatory agency compliance. We routinely work with these agencies to assure the widest variety of our products are recognized as being compliant -- giving designers the broadest selection of candidate materials. A brief overview of the six most common agencies is provided below. Additionally, we have specific product listings with Underwriters Laboratories (UL), American Bureau of Shipping (ABS), ASTM and many global manufacturers. Mitsubishi Chemical Advanced Materials can work with customers to develop unique product/quality specifications requiring testing, inspection and certifications. Such requests should be directed to Mitsubishi Chemical Advanced Materials Engineering Plastic at 1-800-366-0310. 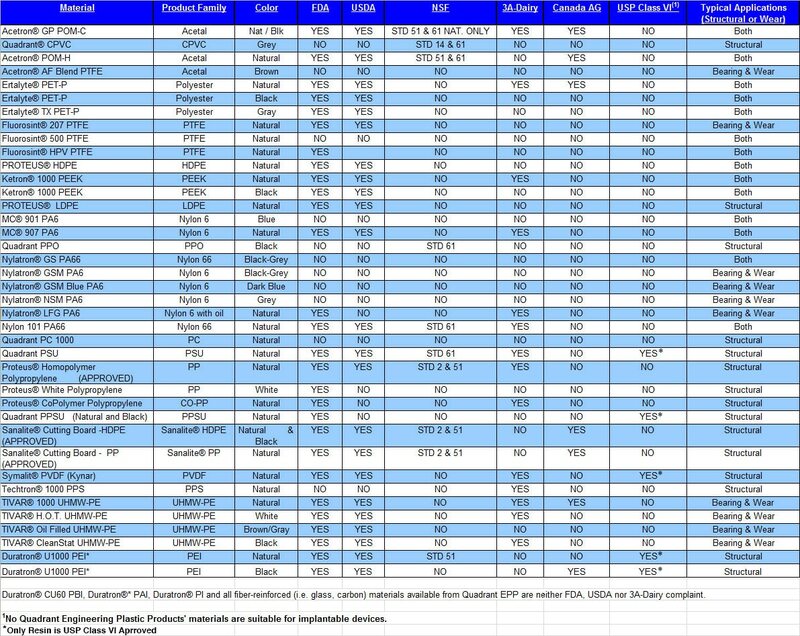 The matrix to the right (click on it to enlarge) provides a quick overview of Mitsubishi Chemical Advanced Materials's materials and the organizations that have verified their compliance. Below, a brief explanation of the organizations is provided. For specific compliance questions or questions about how a material may work in your application environment - give us a call or use our Quick Contact above. FDA (Food & Drug Administration) takes responsibility for determining whether and how manufactured materials may be used in contact with food products. Definitions for proper use are found in a series of regulations published annually under Government Regulations CFR 21. The FDA provides certain specifications regarding composition, additives, and properties. A material which meets these standards can then be stated as FDA COMPLIANT. End-users should note that it is their responsibility to use the product in a manner compatible with FDA guidelines. There are also approvals which may comply with the Food Contact Notification (FCN) of the American Food and Drug Administration of effective premarket notifications for Food and Contact Substances (FCS). USDA (U.S. Department of Agriculture) has jurisdiction over equipment used in federally inspected meat and poultry processing plants, and over packaging materials used for such products. Materials used in this equipment are approved on an individual basis. Determining suitability for use of components and the materials from which they are made is the responsibility of the equipment manufacturer. On request, Mitsubishi Chemical Advanced Materials will supply a "letter of guarantee" for a Mitsubishi Chemical Advanced Materials product listed as USDA compliant. This letter certifies that the material meets applicable FDA criteria. Supporting documentation as may be required by the Food Safety Inspection Service of USDA, is also available. Food Production and Inspection Branch of the Canadian Government is the Canadian government agency equivalent to the USDA. As with the USDA, plastic materials are approved per material for a group of related applications, such as Acetron® GP acetal (material) for meat and poultry processing (application). 3A-Dairy is a voluntary organization that provides standards of construction for milk, cheese, butter and ice cream processing equipment. The organization covers the requirements of plastic materials for multiple-use as product contact surfaces in equipment for production, processing, and handling of milk and milk products. The criteria for approval of plastic materials are specified in 3A standard 20 latest revision, and include: cleanability, bacterial treatment, repeat use conditions, and FDA compliance. Materials are tested for compliance by the material supplier. Supporting documentation must be available as required by a food inspector. The component has been tested to the Standard by the component supplier and is certified as such. The equipment manufacturer must supply documentation that the component meets the Standard, If any testing is required, it must be completed by the equipment manufacturer. Very similar to NSF STD 51, although requires more direct support from the raw material supplier. USP (U.S. Pharmacopoeia) Class VI judges the suitability of plastic material intended for use as containers or accessories for parenteral preparations. Suitability under USP Class VI is typically a base requirement for medical device manufacturers. Mitsubishi Chemical Advanced Materials manufactures a range of materials designed for use in Life Science applications. This range is identified as Mitsubishi Chemical Advanced Materials LSG (Life Science Grade). To learn more, download Mitsubishi Chemical Advanced Materials Materials for Life Science Applications.